Why do the french fries you get at restaurants tend to be much crispier than the ones you make at home? One reason has to do with the cooking technique. The good news is, you can use the same cooking technique that the restaurants use. Another advantage restaurants have is in their equipment—commercial-grade deep-fryers with really accurate temperature controls. But an even bigger advantage comes from the way restaurants use their oil. If you're going to make french fries at home, you're probably going to use fresh cooking oil straight from the bottle. And as it turns out, fresh oil isn't the best oil to use for french fries. When oil is heated, it starts to break down. And oil that has slightly broken down actually produces crispier french fries than fresh oil. It has to do with how effectively the oil molecules bond with the food and fresher oil doesn't bond as well. Complicating matters is the fact that when oil breaks down too much, it starts to smoke. So oil that's too new isn't the best, and oil that's too old isn't the best either. The best oil is oil that's been used continuously for a while. Imagine that cooking oil has a set lifespan. The moment you cook with it, that clock starts ticking and keeps ticking even if you save it and store it in the fridge afterward. Which means that unless you make a lot of fries (like a restaurant does), you'll probably miss the window when the oil is at its peak in terms of producing the crispiest fries. Because even if you use the oil and save it in the fridge for a week, the oil will continue to degrade during the week it's in the fridge. Another restaurant trick is to blanch the fries in water, then freeze them, which allows more of the potato's moisture to escape, thus producing a crispier fry. And generally speaking, restaurants fry their french fries twice: once at a lower temperature to cook the inside of the fry, and then a second time at a higher temperature to brown the exterior. As you can see, there are a lot of steps involved. 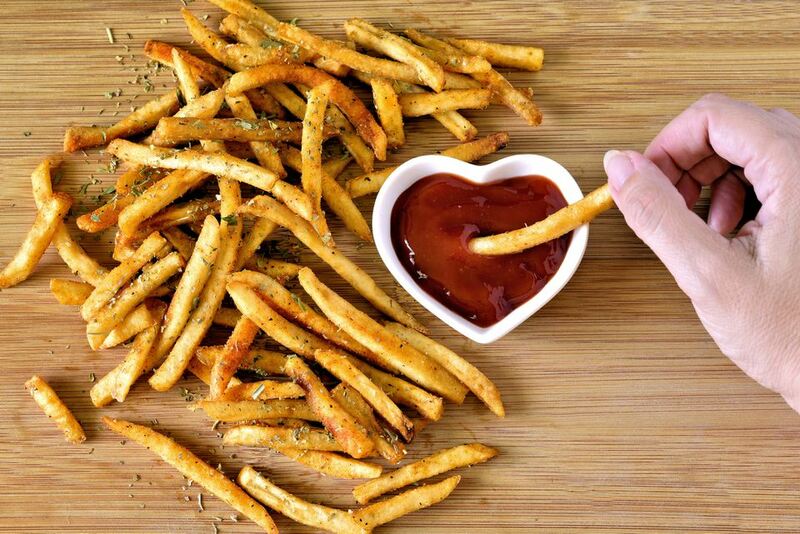 This shouldn't discourage you from trying to make french fries. But it should give you an idea of why restaurant fries tend to be more crispy. However, if you use the proper technique, you can still definitely make delicious french fries at home.